As we do every year, we will have a whole series of photoposts of your Holy Week liturgies, with individual posts for Tenebrae, Holy Thursday, Good Friday, Holy Saturday, and Easter Sunday. As always, we are glad to receive images of the OF, EF, Eastern Rites, the Ordinariate Use, etc., including any part of the liturgy. Please send your photographs to photopost@newliturgicalmovement.org, and remember to include the name and location of the church. Please read this! - Last year, we received so many submissions that the final Easter photopost went up almost a month after Easter itself. This is, of course, all to the good, but I would ask people to do a few things to make it easier for us to process the photos. The first is to size them down so that the smaller dimension is around 1500 pixels. The second is, as much as possible to send the pictures as zipped files, which are a lot easier to process, (not links, and not as photos embedded in an email). The third is to not mix photos of one ceremony with those of another, and to put the name of the ceremony (“Tenebrae”, “Holy Thursday”, “Good Friday”, “Holy Saturday”, and “Easter Sunday”) as the subject of the email. Your help is very much appreciated. 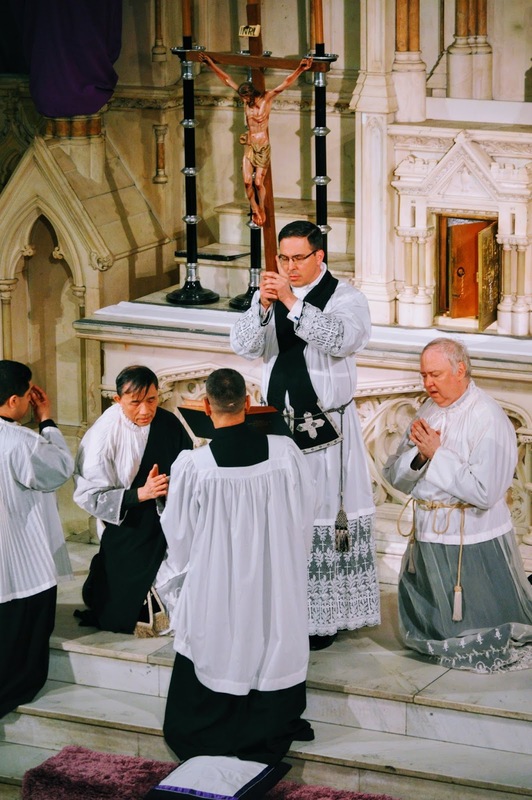 From the second Good Friday 2017 photopost, the unveiling of the Cross at Holy Innocents in New York City.